Did you know that the North Pole is the most northern place on the Earth? That's why it's called the North Pole. Makes sense doesn't it! Besides knowing that Santa Clause and his elves live there, did you know that there are no trees at the North Pole because the ground is made entirely of ice? It's true. * The average temperature at the North Pole is zero degrees- about thirty-seven degrees colder than the inside of you refrigerator. * The North Pole is not as chilly as the South Pole. 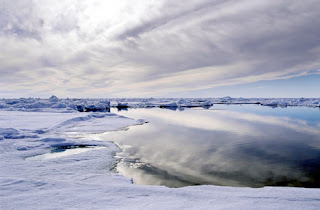 Water underneath the icy North Pole helps keep the temperature warmer. * The first explorer reached the North Pole in 1909. Now it has about 200 visitors each year. * It's light out twenty-four hours a day in summer, and dark all winter. * The North Pole gets so little rain or snow that it is actually a desert.